A speech at the opening ceremony of the 44th Tianguis Turistico Mexico reminded President Andres Manuel Lopez Obrador, who was in attendance, that "tourism is a key piece in the country's economy." 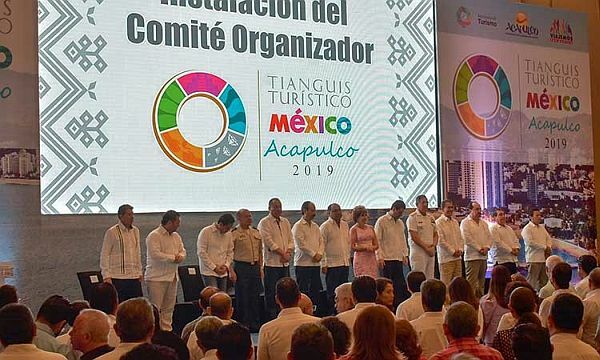 Acapulco, Guerrero, Mexico - At the opening ceremony of the 44th annual Tianguis Turistico, tourism executives minced no words about the new president's dismantling of the Mexico Tourism Board. Addressing President Andres Manuel Lopez Obrador, who was in attendance, Luis Barrios Sanchez, the head of the National Association of Hotel Chains, said in his opening remarks, "You have distinguished yourself by your tireless struggle to improve the conditions of the less favored. Do not doubt, Mr. President, our commitment is to accompany you in this task. But it is important to remember that, in addition to everything said, tourism is a key piece in the economy." Sanchez went on to say that tourism contributes 8.8% of the country's GDP. "We cannot ignore that the United States is and will continue to be the main tourist client of the country, representing 60% of air tourism and practically all land and border travels," he said. The past year was a challenge for Mexico tourism. Air capacity fell by 1.7 million seats in 2018. Meanwhile, Sanchez said, the Bahamas, Jamaica, Puerto Rico and the Dominican Republic added capacity. "We need your support to have capital to carry out Mexico's tourism promotion," Sanchez told the president, to applause from the audience. Sanchez praised the plan for a Mayan train route on the Yucatan Peninsula, asserting that it will bring new visitors to the southeast of the country and open up previously hard-to-reach sites. "However, the financing of this work cannot leave behind the effort of attraction of tourism," he cautioned. In order to sustain Mexico's ability to compete for foreign tourists, Sanchez asked the government to contribute $125 million per year, about 0.5% of the revenue tourism brings to Mexico. Lopez Obrador was the last speaker to take the stage, and while he did not directly respond to Sanchez, he delivered a prepared statement regarding tourism. "To reiterate what has been said, tourism is fundamental because it produces wealth, but also tourism distributes wealth," he said. "That is why the commitment to support tourism is sincere." The President did not address the dismantling of the Mexico Tourism Board. He did say that the government is emphasizing two actions that will help to increase tourism. One is the urban development of tourist cities, and the other is reducing crime. "Here in Acapulco, for example, [the city] has already started an urban development program in El Renacimiento neighborhood," he said. "We have committed resources for urban development, introducing water drainage, improving the streets, putting in public lighting, expanding and creating centers for recreation and also public safety." This year, the government plans to invest $26 million in Acapulco, followed by another $26 million in 2020. The government also plans to invest in Los Cabos, the Bay of Banderas region, Playa del Carmen and Puerto Vallarta. In terms of safety, the new government has unanimously approved the creation of a National Guard, which will involve both the army and the navy. The government is uniting the military police, naval police and federal police, as well. "Every day, from Monday to Friday at 6 in the morning, we are receiving the daily report of what has happened throughout the country, and the same thing is being done by governors who are working in the same coordinated manner," he said. "All of this is going to bear fruit. It will help us to lower the incidence of crime and will help Mexico remain a country visited by foreigners."